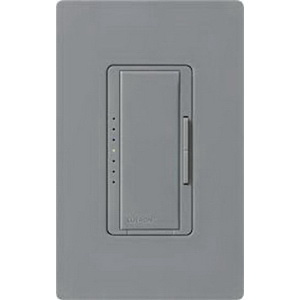 Lutron Maestro® 3-Way dimmer switch in gray color, has durable plastic construction with gloss finish. It is a large tap switch with a rocker-style dimmer for a standard designer wallplate opening. This switch supports advanced dimming technology for compatibility with a broader range of high efficacy bulbs. It is capable of controlling up to 150-Watt dimmable CFL/LED or 600-Watt incandescent/halogen or mixed bulb type per multi-Gang and mixed bulb type ratings. This switch is perfect for indoor use only and use in 1-Pole, 3-Way or multi-location dimming applications. It operates at a voltage rating of 120-Volts, temperature rating of 0 to 40 deg C and current rating of 1.25-Amps. The dimmer switch meets UL 1472, CSA C22.2 184.1 and NOM standards.